This is a magazine prototype made for Asian American Women in the U.S. 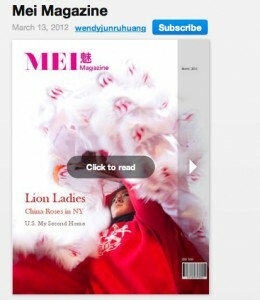 The magazine consists of three sections: the story of a family that has three generations of women involved in the traditional Lion Dancing in New York’s Chinatown; five little stories of five Chinese American women of different generations and professions; a documentation of aged first-generation Asian american women. click on the image below to read it online. You could also get a print version if you like.